Chamaeleo calyptratus, the veiled chameleon, is the hardiest of the true chameleons and thus the most popular in the pet trade. This is one of the most striking chameleon species, with almost impossibly bold coloration and a casque atop the head that can reach 10 centimeters in height. Various theories have been put forth for the function of the casque: a device to aid in collecting water; a device to facilitate heat dissipation; or, most recently, a device to amplify a low-frequency 'buzzing' used for intraspecific communication (click here to hear the 'call' of the veiled chameleon). In the wild, veiled chameleons occupy the western coast of Yemen and the southwestern coast of Saudi Arabia at altitudes up to 2500 meters. The oldest known chameleon is Anguingosaurus brevicephalus from the Middle Paleocene of Anhui, China. 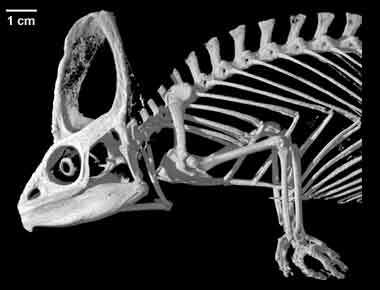 Other chameleons in the fossil record include Chamaeleo caroliquarti (Lower Miocene, Dolnice, Czech Republic and Wintershof-West, Bavaria) and C. intermedius (Upper Miocene, Fort Ternan, Kenya). There are 80-85 living species of chameleons, all but four of which live in Africa (south of the Sahara) or Madagascar. Chameleons are divided into two general groups: 'normal' chameleons (Chamaeleo, Bradypodion, Calumma and Furcifer) and 'dwarf' chameleons (Brookesia and Rhampholeon). The largest chameleon (Calumma parsonii [formerly Chamaeleo parsonii], Parson's chameleon) can exceed 60 cm in length -- the size of a domestic cat -- and the smallest (Brookesia minima, pygmy leaf chameleon) measures only about 35 mm -- twice the length of a human fingernail. Chameleons are known for their projectile tongues, independently moving eyes, laterally compressed bodies, prehensile tail and zygodactylus (grasping) feet. They are predominantly insectivorous, and when a chameleon spots its prey a complex set of behaviors is set into motion. While rocking back and forth, the chameleon looks at the prey from several angles for help in distance determination. Chameleons estimate the distance to their prey using accommodation, and are the only animals known where focus information provides the primary cue for distance estimation with accommodation. After estimating a distance, the chameleon aligns its head's axis towards the target and fixes both eyes on the prey (at which point their accommodation becomes linked). The tongue, tension loaded by the hyoid apparatus, is finally shot out to precisely grab the prey. elevated relative to remainder of palate and thus separated from maxillary and pterygoid process of palatine by a distinct step formed by edge of internal naris (results in dorsoventral compression of nasal capsule and very low nasal septum); quadrate ramus of pterygoid greatly expanded to form wing-shaped structure; loss of bony connection between pterygoid and quadrate; fenestra 'rotunda' closed, and system for mobilization of endolymphatic fluid concomitantly modified; basioccipital portion of occipital condyle reduced, often excluded from border of foramen magnum; dorsal midsagittal crest of supraoccipital meets ventral midsagittal crest of parietal; retroarticular process reduced; scleral ossicles reduced to 11 (1,5,7 positive, 4,6,8 negative); elongated processus lingualis of hyoid serves as support for highly protrusible tongue; when tongue retracted, first ceratobranchials directed anterodorsally rather than posterodorsally; centra of presacral vertebrae elongate and cylindrical; number of cervical vertebrae reduced to 5; anterior coracoid emargination lost; scapula extremely tall and narrow, suprascapular cartilage relatively small; olecranon process of ulna relatively short; ball and socket intercarpal joint, with ball formed by large central carpal and socket formed by radiale, ulnare and pisiform; metacarpals relatively short and flat, shorter than proximal phalanges; manus modified for grasping with digits 1,2,3 opposing digits 4,5, and opposing groups of phalanges united by skin; body strongly compressed laterally; eyes relatively large and capable of independent movement, covered by a thick granular lid except for small opening for pupil. This frozen specimen originated in the pet trade and no locality information is known. It was made available for scanning by Dr. Travis Laduc of the Texas Memorial Museum. Funding for scanning and image processing was provided by a National Science Foundation Digital Libraries Initiative grant to Dr. Timothy Rowe of The University of Texas at Austin. The upper body of the specimen was scanned by Matthew Colbert on 11 July 2003 along the coronal axis for a total of 1080 slices. Each slice is 0.105 mm thick, with an interslice spacing of 0.105 mm and a field of reconstruction of 94.5 mm. Barnett, K. E., R. B. Cocroft, and L. J. Fleishman. 1999. Possible communication by substrate vibration in a chameleon. Copeia 1999:225-228. Estes, R., K. de Queiroz, and J. Gauthier. 1988. Phylogenetic relationships within Squamata, pp. 119-281. In R. Estes and G. Pregill (eds. ), Phylogenetic Relationships of the Lizard Families: Essays Commemorating Charles L. Camp. Stanford University Press, Stanford, California. Hillenius, D. 1978. Notes on chameleons IV. A new chameleon from the Miocene of Fort Ternan, Kenya (Chamaeleonidae, Reptilia). Beaufortia Number 343 28:9-15. Lianhai, H. 1976. New materials of Palaeocene lizards of Anhui. Verterata PalAsiatica 14:45-52. Moody, S., and Z. Rocek. 1980. Chamaeleo caroliquarti (Chamaeleonidae, Sauria): a new species from the Lower Miocene of central Europe. Vestnil Ustrediha ustavu geologickeho 55:85-92. Ott, M., and F. Schaeffel. 1995. A negatively powered lens in the chameleon. Nature 373:692-694. Ott, M., F. Schaeffel, and W. Kirmse. 1998. Binocular vision and accommodation in prey-catching chameleons. Journal of Comparative Physiology A: Sensory, Neural, and Behavioral Physiology 182:319-330. Schmidt, K. P., and R. F. Inger. 1957. Living Reptiles of the World. Doubleday and Company, Inc., Garden City, New Jersey. Click on thumbnail for animation of specimen rotating around the yaw axis as his colors change. Animation is 2.3mb. To cite this page: Dr. Jessie Maisano, 2003, "Chamaeleo calyptratus" (On-line), Digital Morphology. Accessed April 19, 2019 at http://digimorph.org/specimens/Chamaeleo_calyptratus/whole/.